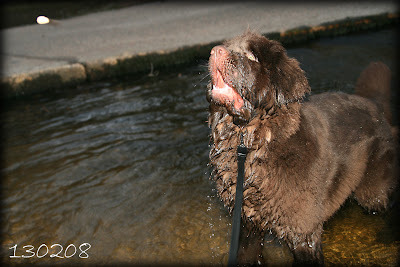 Took Martha for a little paddle in the ford up at Moyles Court after work. She of course had great fun, fetching sticks and catching biscuits! Love this shot of the biscuit on it's way into her big gob! I'm going to try and have a play with my lovely new scrapping goodies now! A girl can change her mind..
Guilty Pleasure? I'm not guilty! Martha My Dear and a Challenge! Now this is what I call Spring!